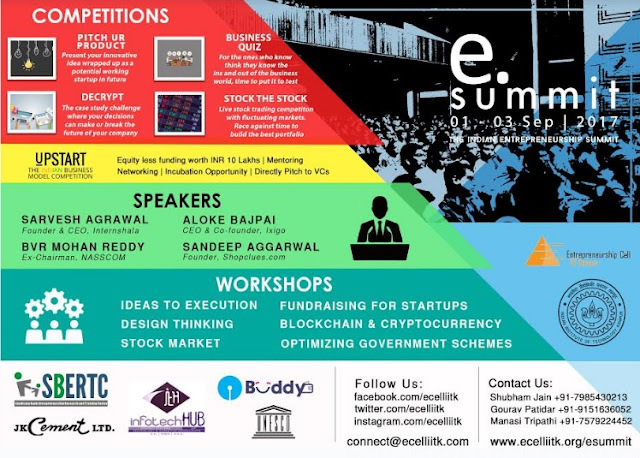 Free up your schedule this 1st, 2nd and 3rd of September as Entrepreneurship Cell IIT Kanpur, brings once again its annual flagship event ‘eSummit’. Wake the entrepreneurial spirit within you and gear up for an entrepreneurial event like no other. From inspiration to skill building, basics of starting up to raising funding, this summit covers it all. With the theme of ‘Seeding the Impact’, it aims at providing the entrepreneurs with the right set of resources for laying a firm foundation of their venture, the key to any successful startup being ‘getting it right’ from an early stage. Comprising of talks, workshops, and competitions – there is bound to be not a single dull moment. The pre-summit events are scheduled to be conducted in Kanpur and Lucknow starting from next week, catering to the young age entrepreneurs and the established ones alike. The line-up for workshops this year includes technical ones like Sixth Sense Robotics, Android App Development, and Ethical Hacking while the non-technical ones range from Design Thinking to Entrepreneurship through the eyes of Neuroscience. Sounds unconventional? That’s exactly what eSummit’17 promises to be. An event for those who think beyond, dare to venture beyond the ordinary and are not afraid to take the leap of faith. So whether you’re someone who’s already familiar with the entrepreneurial world or just looking to explore the startup culture or looking for exciting stuff to do on the weekend, this is one event you should definitely watch out for. And not to forget, prizes worth INR 10 Lakhs are at stake! Next articleHow Mercedes AMG GT Roadster and AMG GT R Will Perform in India?